Home > Dining and Gourmet > Cafe > Starbucks: Get $1 OFF One Handcrafted Beverage! Log into your Starbucks Rewards account to add your reward to your account. Pay with your Starbucks Card to redeem your treat. Voucher is valid for 7 days. The voucher is not valid on breakfast sets nor with any other promotions or privileges. All vouchers are valid for a one-time use only. 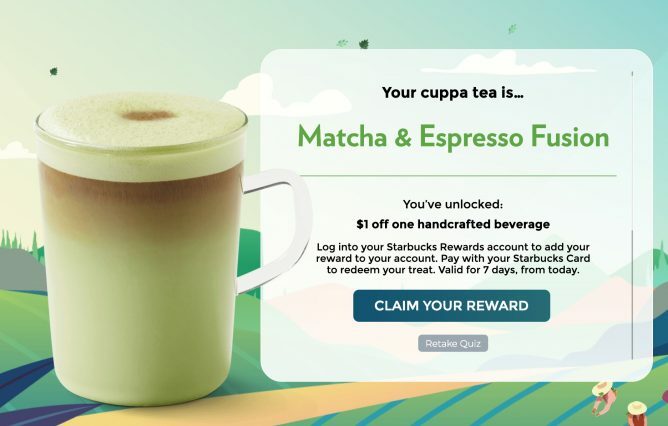 If I’m not a Starbucks Rewards™ member, you can still play the quiz. 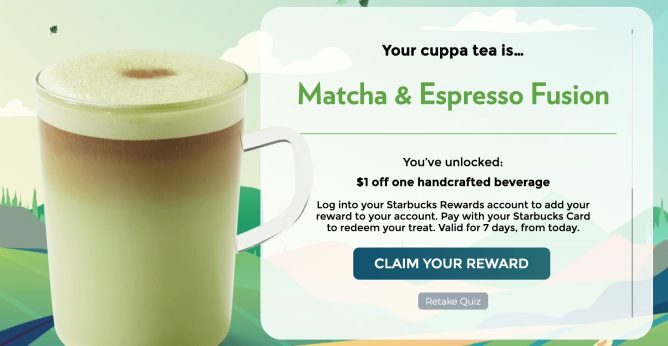 Follow the instructions after you’ve completed the quiz to create a Starbucks account so the voucher can be credited to your account. Previous: [Neiman Marcus] Want a $75 gift card? Next: Triple Three Restaurant: Enjoy 1-for-1 Lunch Buffet & 50% OFF 2nd Diner for Dinner Buffet with DBS/POSB Cards!